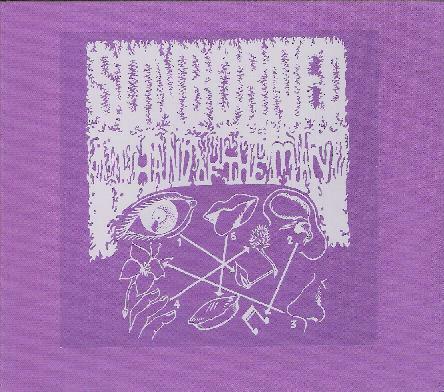 Sunburned Hand of the Man - "s/t"
Of the three Wabana concert LP reissues I reviewed in this issue of AI, this one definitely has the best sound quality. Now I haven't actually heard any other Sunburned Hand of the Man other than this, but on this live document recorded in 2003, the band jams away, producing a murky melange of noise, jazz, folk, and low-key industrial music. The opening track, Eye, is a funky jam with all sorts of weird noises winding and bleeping throughout the mix. Ear is a 10-minute jam where the rigid, noise rhythms of industrial music meet the freeform chaos of free jazz. Nose is a murky, clunking meditation with some jazzy and folk influences. The final cut, the 18-minute Hand is a free jazz magnum opus, full of deep space drones and crazy sounds, reminding me a little of Sun Ra. I have no idea how this compares in style or sound quality to the band's other works, but this was definitely the best of the Wabana reissues so far...a weirdly enjoyable, crazy twilight journey into some netherworld of musical madness. For more information you can visit the Sunburned Hand of the Man web site at: http://www.sunburnedhandoftheman.com. Visit the Wabana Records web site at: http://www.surefiredistribution.com/wabana.